Double waterfalls are a rarity and this one is a hidden gem! 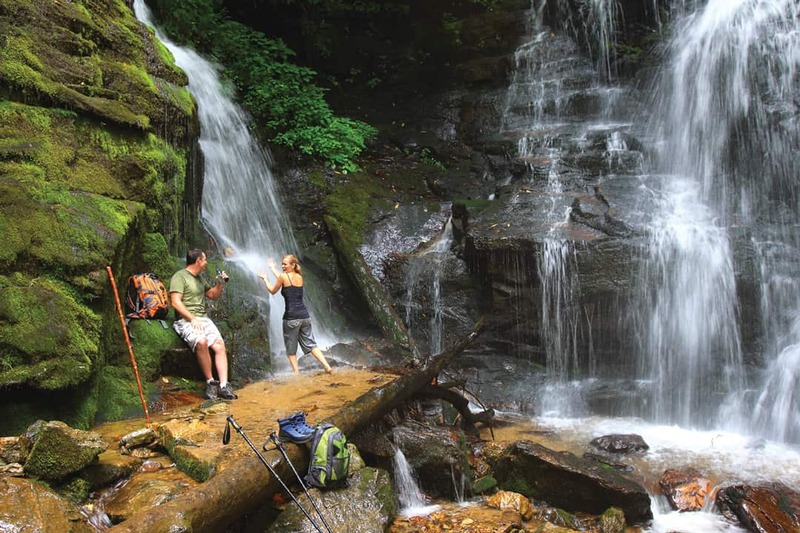 Soco Falls, located just a short walk off the main road, is a perfect way to start your scenic adventure. The falls sit right in between Maggie Valley and the Cherokee Indian Reservation. From Maggie Valley head up US 19 South to the Blue Ridge Parkway. Cross under the Parkway and continue downhill towards Cherokee. From the Parkway, it’s 1.5 miles to a marked pull-off on the left side of the road. There’s a small blue sign indicating Soco Falls 0.5 miles ahead. The trail begins at the break in the guardrail. The short, steep trail ends at a viewing deck overlooking the falls. For a closer view, continue down a steep trail from the deck to the base of the waterfalls. Be careful, this section has some ropes to help with balance and can be very slippery.